This article on songwriting skills is part 5 of a 6 part songwriting tips series. One of the most CRUCIAL songwriting skills is the ability to be creative. Creativity is what separates an "average" song, from a song that get's instant attention and creates an incredible enjoyable listening experience. 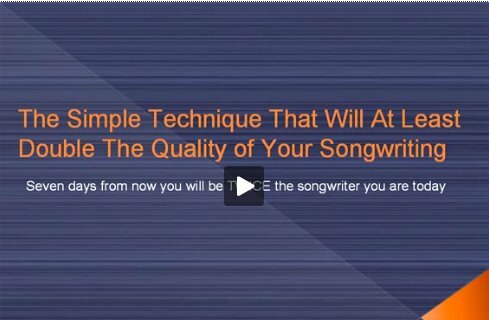 So here's a songwriting tip that will allow you to master this crucial songwriting skill. This tip is quick and easy, but it will have a profound impact on your ability to be extremely creative. When you write music or lyrics you must keep the "creating" and the "editing" separate. The worse "creativity killer" is the analytical part of your mind. This is the part that judges everything you do. If you try and judge something AS you are creating it, the creative part of your mind "shuts down". This concept actually goes very deep, and has a lot to do with the parts of your mind that are "conscious" and "unconscious", but you don't actually need to understand these topics to make this principle work for you. All you need to do is this. You must turn off your "internal editor". Instead of concentrating on how good your ideas are, allow yourself to create without judgment. Once you have finished creating, only then is it time to consult your inner critic and evaluate your work. Always keep your creating and your editing separate! If you stick to this create-edit-create cycle, you will be working with your minds natural abilities instead of against it.Following this principle will also make your songwriting process much faster and less frustrating. It will also allow you to unblock the barriers that are stopping you from accessing your very best ideas.